Em 18 de junho, Leah Librescopublicou seu último texto na porção ateísta do Patheos, e seu blog automaticamente migrou para a seção católica do portal. 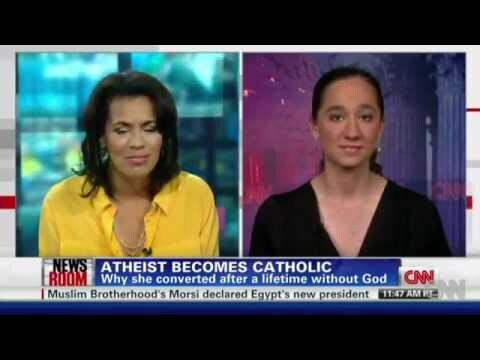 É que Leah se converteu ao catolicismo, aceitando a existência de Deus, ainda que assuma que tem algumas questões pendentes com a ortodoxia cristã, que terá que lidar futuramente. Segundo a blogueira, sua conversão se deu quando ela percebeu que tinha um forte instinto moral e que nenhuma filosofia conseguia dar suporte ao seu pensamento sobre a questão. As melhores respostas ela encontrou em Santo Agostinho, São Tomás de Aquino, C. S. Lewis e G. K. Chesterton, e aí ela percebeu que aquilo que ela reverenciava como Moral era na verdade Deus. O portal Patheos é uma espécie de território livre na internet onde colunistas e pessoas podem transitar de um lado para outro, escrever e dialogar sobre questões de fé ou da falta dela de maneira respeitosa. I could see where they were coming from, but I stayed put. I was ready to admit that there were parts of Christianity and Catholicism that seemed like a pretty good match for the bits of my moral system that I was most sure of, while meanwhile my own philosophy was pretty kludged together and not particularly satisfactory. But I couldn’t pick consistency over my construction project as long as I didn’t believe it was true. While I kept working, I tried to keep my eyes open for ways I could test which world I was in, but a lot of the evidence for Christianity was only compelling to me if I at least presupposed Deism. Meanwhile, on the other side, I kept running into moral philosophers who seemed really helpful, until I discovered that their study of virtue ethics has led them to take a tumble into the Tiber. (I’m looking at you, MacIntyre!). Then, the night before Palm Sunday (I have excellent liturgical timing), I was up at my alma mater for an alumni debate. I had another round of translating a lot of principles out of Catholic in order to use them in my speech, which prompted the now traditional heckling from my friends. After the debate, I buttonholed a Christian friend for another argument. During the discussion, he prodded me on where I thought moral law came from in my metaphysics. I talked about morality as though it were some kind of Platonic form, remote from the plane that humans existed on. He wanted to know where the connection was. After I changed my mind, I decided to take a little time to make sure I really believed what I thought I believed, before telling my friends, family, and, now, all of you. 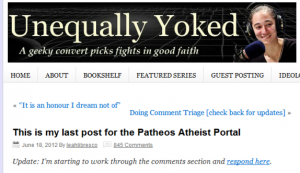 That left me with the question of what to do about my atheism blog. My solution was to just not write anything I disagreed with. Enough of my friends had accused me of writing in a crypto-Catholic style that I figured no one would notice if I were actually crypto-Catholic for a month and a half (i.e. everything from “Upon this ROC…” on) . That means you already have a bit of a preview of what has and hasn’t changed. I’m still confused about the Church’s teachings on homosexuality, I still need to do a lot of work to accept gifts graciously, and I still love steam engines.